This blog's readers poll points to the middle infield as the biggest weakness on the Twins. My belief all season has been, and remains, that it's the bullpen depth. Friday's 11th inning meltdown (six runs) underlines that belief. Bobby Keppel: A leadoff four-pitch walk, two singles, no outs. Gone. Jesse Crain: Three singles, one walk, no outs. Gone. R.A. Dickey: A single, then — finally — three outs. The first two guys are the top alternatives to Jose Mijares and Matt Guerrier, who have been quite good this year but are in danger of being overworked. 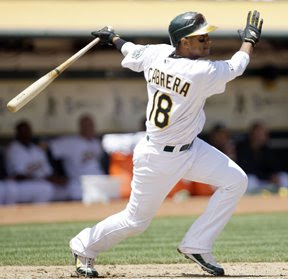 I don't have a serious argument with the Orlando Cabrera trade; obviously, the middle infielders (Nick Punto, Alexi Casilla, Matt Tolbert, even Brendan Harris) haven't hit. But I have more confidence in Punto and Casilla than in Keppel and Crain. The Twins weren't the only AL Central contender wheeling and dealing Friday before the nonwaiver trade deadline. Detroit traded for Jarrod Washburn (above); the White Sox finally got Jake Peavy. The Washburn trade doesn't strike me as much of an upgrade for the Tigers. They gave up Luke French , like Washburn a left-handed flyball pitcher, and a minor leaguer who didn't figure to be a factor for Detroit this year. Washburn, unlike French, has a track record. He's racked up far better numbers this season than in recent years (2.64 ERA). Washburn has been aided considerably this year by the Seattle outfield defense, which frequently features three legit center fielders. The Detroit stadium is just as spacious as Seattle's, but the Tigers' outfield speed, especially in the corners, don't compare. The Twins were hot for Washburn last year, a notion that struck me then as borderline insanity. He's been far more effective this year, but even if he maintains his current success, I won't criticize the Twins for staying away this summer. The Peavy trade may not do anything to help the Chisox this year. The former NL Cy Young Award winner has been on the DL since early June with a strained tendon in his foot; before the trade, his agent said there was no timeline for his return. Now Peavy is talking about being ready by the end of August. Meanwhile, the White Sox lose a piece of their current starting rotation in Clayton Richard. And a first-rate pitching prospect in Aaron Poreda. And Peavy has benefited mightily from pitching in a very pitcher-friendly home park in San Diego. Last season, for example, he had a home ERA of 1.75 and a road ERA of 4.28. Now he's going to have a launching pad for a home park. The Twins on Friday traded for shortstop Orlando Cabrera (above) from Oakland for a minor league shortstop, Tyler Ladendorf. This is a true going-for-it-now deal. Cabrera is 34 and on a one-year contract. If he qualifies as a Type A free agent — and he currently projects to — his contract prohibits his team from offering arbitation, so the Twins would not get any draft pick compensation. He can hit a bit, and he's got a pair of Gold Gloves on his resume, but at 34 he's lost a step or two, and even in his youth he was rather miscast as a top-of-the-order hitter. Still, he should improve the middle infield, pushing either Nick Punto or Alexi Casilla out of the lineup. Ladendorf is an interesting prospect, a shortstop with offensive potential, but odds are that he'll wind up moving to a different position before he reaches the majors (if he does). This doesn't do anything to help the Twins in the long run or even the medium run — I don't expect them to re-sign Cabrera — and may hrut them over time if Ladendorf turns into a top-flight second baseman. Come 2010, the Twins will still have a hole in the middle infield. But for 2009, it should work. It's a typical week for the White Sox coming to Minnesota. You spend a nice day here and get your [rear] kicked. I don't see anything different ever since I started managing this club. — Pale Hose skipper Ozzie Guillen after the Twins completed a three-game sweep on Wednesday. Comment: Guillen took over the Sox for the 2004 season. Under his guideance, the White Sox have a record of 484-429, .530 (and, of course, a World Series title). Against the Twins, the Sox are 52-53, .495. That breaks down as 29-23 for Chicago in their park, 23-30 in the Metrodome. I want to see these piranhas in a different lake next year. I want to see these piranhas hit in 20-below. * The New York Times says Manny Ramirez and David Ortiz were among the positive tests in the 2003 "confidential" tests. Comment: Anybody surprised by this hasn't been paying attention. Before I delve into this: Jazayerli may nor may not understand the Twins approach; if he understands it, he certainly doesn't buy into it. And I don't believe that he offers any real insight to the thinking of the Royals front office; indeed, if Rany's got a strong viewpoint on something, the odds are that the Royals think almost exactly the opposite. So this is no reason to believe there's anything cooking here. That caveat given: There's no way the Twins are dealing Ben Revere for Callaspo. The only way they'd consider doing Carlos Gomez for Callaspo is if the Twins believe Callaspo is a better defensive player than Jazayerli does. Delmon Young? The Twins might not have been willing to make such a swap last winter; I think they would now. But ... when the Twins traded for Alexi Casilla (they sent J.C. Romero to the Angels for him), Callaspo was still in the LAA organization. I remember at the time wishing the Twins had landed Callaspo or Erick Aybar in that trade (I saw them play for Cedar Rapids one summer night in 2003 and was very impressed with both). I don't know if the Twins asked for Callaspo at the time and were turned down; I don't know if they preferred Casilla. If they liked Casilla more in 2005, they might be reluctant now to decide they were wrong then. When he's on — and he has been of late — Mark Buehrle of the Chicago White Sox makes pitching look easy. Move the ball in and out, up and down. Change speeds. Work fast. He's a pitching coach's mantra come to life. I sat the the outfield cheap seats Wednesday night watch Brian Duensing, an emergency fill-in starter for Francisco Liriano, do a passable Buerhle imitation. He threw just nine pitches in the first inning. Every one of them was a strike. He threw 16 pitches in the second inning; 12 strikes, four balls. Two of those balls were to Alexi Ramirez, who is well-known to have little regard for the strike zone, so I assume Duensing was trying to miss the zone with those pitches. For the game, Duensing threw 64 pitches: 48 strikes, 16 balls, a very impressive 3-to-1 ratio. I doubt we'll ever see Liriano display that kind of control. It wasn't a flawless performance. He did give up a couple of homers. I doubt that he convinced anybody that if one of the current starters got hurt he'd be no major downgrade. But for one night, he got the job done. Two other keys to that game were players who have had bad seasons so far. Jesse Crain picked up the "W" with two scoreless innings. He allowed leadoff hits in both frames, then induced around-the-horn double plays from right-handed sluggers (Paul Konerko in the sixth, Carlos Quentin in the seventh). And Alexi Casilla had a pair of RBI hits, one of them a double, and stole a base — and in the field was the pivot man on both of Crain's DPs. We can file this game under "blind pigs find acorns," or we can hope this is a sign that what was expected from them might still be forthcoming. There's a lot of chatter about the Twins as the trading deadline approaches. The Twins are said to be talking to Oakland about shortstop Orlando Cabrera. They're supposedly sniffing around Pittsburgh second baseman Freddy Sanchez and Toronto shortstop Marco Scutaro. The Twins' All-Stars (Joe Mauer, Justin Morneau, Joe Nathan) are demanding that something be done. One problem: The same dearth of high-minors talent that has kept the Twins from solving their problems from within affects their trade possibilities. This is the Twins' hidden hole. There's just not much on the farm, at least at Triple A and Double A. Pitching? Ron Gardenhire made it clear after the news that Kevin Slowey is done for the season: Everybody throwing well in Rochester is already here. Middle infield? The Twins' second basemen are hitting, for the season, .183. If there was somebody at Triple A they though could do better, he'd be here. What talent is in the nigh minors is spoken for. 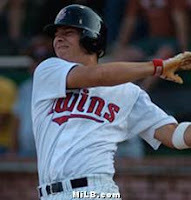 The best example is 3B prospect Danny Valencia (photo above). Oakland reportedly insists on Valencia in any Cabrera deal. Valencia, ticketed to take over third base for the Twins in 2010, is tearing up Triple A. He's a five-year solution to third base, capable of adding a low-cost right-handed power bat to the Twins left-handed core. I'm lukewarm about Cabrera — he's 34, his range is diminishing, and his contract is said to have a clause prohibiting his club from offering arbitration if he's a Type A free agent again, which seems possible. He had a lousy start but is hitting .375 this month. Dealing Valencia for a fading shortstop would be a mistake. There is an area in the minors in which the Twins have a surplus: toolsy outfielders. I doubt they're going to deal the likes of Ben Revere or Aaron Hicks to anybody, even if Hicks is struggling in low-A Beloit. But that still leaves the likes of Rene Tosoni, the MVP of the Futures Game, to dangle for an infielder or relief arm. But that's not going to be enough. In some ways, the Twins are in an advantageous position at this trading deadline. Their attendance is up; most teams are looking a slumping ticket sales. They don't want to burn all their payroll space now — not if they plan to sign Mauer to a new contract this winter, and they better have that in mind — but they can handle a salary dump. As the Friday afternoon non-waiver deadline approaches, that may be the Twins advantage. Gloom, doom and ... sunny skies? Funny what a couple wins — and a couple of Detroit losses — can do. At this moment, the Twins are just three games behind the Tigers, one behind the White Sox. This despite the lousy road trip. * This is a true setback for the Twins: Kevin Slowey is out for the rest of the year. Anthony Swarzak gets to stick in the rotation. Behind him, should anything happen to one of the the starters, is a void. The Twins aren't particularly impressed with any of their remaining Triple A starters (Kevin Mulvey, Phil Humber, Jason Jones being the three with the most starts now that Swarzak and Brian Duesning are in Minnesota). * At least Glen Perkins bounced back Monday from his debacle in Oakland. His shoulder may not be completely pain free, but it's functional. * Mark Buehrle's game Thursday was the 18th official perfect game. That official list leaves out two games that went extra innings, and the pitcher allowed a baserunner after the ninth inning. The first, and most famous, was that of Harvey Haddix on May 26, 1959. The Kitten — so dubbed for his resemblance to Harry "the Cat" Brecheen — threw 12 shutout innings. In the 13th, his third baseman, Don Hoak, committed an error. He walked Henry Aaron intentionally. The Joe Adcock hit a pitch over the fence — but passed Aaron between second and third. The result was a one-run double, not a three-run homer — but still a win for Milwaukee. The second was that of Pedro Martinez on June 3, 1995. He gave up a leadoff double in the 10th inning and was immediately relieved by Mel Rojas, who wrapped up the Montreal win. At least Pedro got the W. All Haddix got out of it was a loss. The 1998 lineup had Paul Molitor, but by then Molly was a shell of what he had been. And the rest of the lineup ... well, there were a lot of reasons the Twins of the late '90s were so bad, and many of those reasons were playing that day. * The worst pitcher to throw a perfect game may have faced the toughest lineup. Charlie Robertson on April 30, 1922 did it to the Detroit Tigers. The Tiger outfield featured Ty Cobb (batting average that season of .401), Harry Heilmann (.356) and Bobby Veach (.327). As a team that year, the Tigers averaged .306. Robertson was making only his second major league start. It did not presage a glorious career: He finished his career 49-80 with an ERA of 4.44 and never had a winning season. * Addie Joss' perfecto on Oct. 2, 1908 has frequently been called the greatest pitchers duel ever. He and fellow Hall-of-Famer Ed Walsh matched up in this heated pennant race game. Joss threw a perfect game; Walsh struck out 15 and allowed a single unearned run. Joss, possessor of the game's best fast ball at the time, would be dead in three years. A week ago, it seemed clear that if the Twins did anything before the July 31 trading deadline, it would be as buyers, not sellers. With one game left to another disastrous West Coast swing, it's not so certain. As with last year's GOP-inspired death march up and down the Pacific Coast and into Canada, the Twins started this post-All Star trip swing with a pair of wins. Then came last Sunday's 12-inning loss at Texas, a pair of pitching disasters in Oakland, and now three straight losses in Anaheim. The bullpen? 21 earned runs in 28.2 innings — 6.59 ERA. Then there's the middle infield. Alexi Casilla has started every game on this trip. He is 4 for 32, a .125 batting average. That is also his slugging percentage. I'm starting to take a morbid fascination in watching this man's career spiral down. Nick Punto is 5 for 24, a .208 batting average. This is actually an improvement. Brendan Harris is 4 for 27 (.148) and is now hitting .179 for the month. The thing is, they weren't that far from a decent road trip. They coulda-shoulda won last Sunday. They coulda-shoulda won that ridiculous 14-13 game in Oakland on Monday. They coulda-shoulda won the first game in Anaheim, the extra-inning affair in which the game-tying hit bounced off Joe Nathan's glove and off second base. Hang on to just two of those three, and the Twins would be 5-4 going into today's finale in Anaheim. Not sure who the somebody else is. Justin Morneau, probably. I can't see any real reason for anybody to put Denard Span or Michael Cuddyer ahead of Gomez, or any other infielder ahead of Punto. Progress, in an odd way: This one was simply a routine loss, not a total collapse, not an extra-inning heartbreak. John Lackey, a good pitcher, pitched well for Anaheim (I refuse to call the Angels a Los Angeles team); Francisco Liriano, still trying to reinvent himself, gave up three homers. Liriano became the first AL pitcher to 10 losses. Liriano wasn't completely terrible for five innings — not great, but not awful — but the first four batter of the sixth inning got hits, and the third hit was a three-run homer. 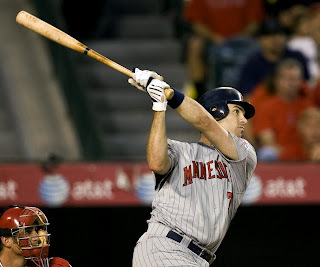 Joe Mauer (above) hit a pair of homers off Lackey, one to left, one to right, both solo shots, and is now at .365 with 17 homers. Those homers accounted for half the hits the Twins got off Lackey and all the runs. I think it's safe to say he's out of his slump. * Kevin Slowey couldn't play catch Friday, and his scheduled rehab start in Rochester isn't happening. This may be a bigger blow to the team's pennant hopes than the loss. * Alexi Casilla went 0 for 3, dropping his batting average to .164 and his OPB to .240. The Twins got absolutely nothing offensively from the bottom third of the order — Delmon Young, Nick Punto and Casilla combined to go 0-10 with four strikeouts. * Jesse Crain got five outs, but his command was still off — 10 balls, 16 strikes, one hit batsman. I can't regard the outing as encouraging. Here's the recipe for this loss: Combine another short start with a handful of lousy relief outings, mix in a baserunning blunder and top it off with a flukey hit. Short start: Scott Baker went just five innings, 106 pitches and nine baserunners. Lousy relief outings: Bobby Keppel continued his recent streak of living down to my expectations, falling behind all four hitters he faced in the sixth inning and giving up a run. Joe Nathan coughed up a two-run lead in the ninth, burning through 29 pitches in the process. And Jesse Crain — the last man standing in the bullpen, because R.A. Dickey and Brian Duensing had been abused in Wednesday's fiasco in Oakland — picked up in the 10th inning where he left off before his demotion to take the loss. It wasn't as if Nathan was getting shelled — the first hit he gave up was off the end of the bat, and the second (shown above) was a piddly grounder that hit the second base bag and bounced away from Nick Punto and Alexi Casilla. That flukey hit tied the score. But he walked the leadoff man, hit another and threw 13 balls to 16 strikes, which is not a winning ratio. For that matter, both Keppel and Crain threw seven strikes and six balls. Baserunning blunder: The Twins had Carlos Gomez on second, Denard Span on first with two outs in the eighth. Joe Mauer singled to left center. Span, for some reason, decided to go to third, and center fielder Gary Matthews Jr. easily threw him out. A silly play by Span, since Matthews was headed in the direction of his throw. The out meant Justin Morneau didn't get to hit that inning. * Jose Mijares and Matt Guerrier combined for 2 1/3 scoreless innings to get the lead to Nathan. Guerrier threw 11 pitches, 10 of them strikes — something the other guys should have tried. * Jason Kubel hit a two-run jack in the first. *Mauer went 3 for 4 with a walk, two runs, two RBIs and a double. He's now hitting .363 and is back atop the AL batting averages. On the injury front: Glen Perkins is said to have a mild case of tendinitis in his shoulder and is expected to pitch Monday after all. And Joe Crede had an injection in his sore shoulder and is to be re-evaluated Sunday. For now, at least, he's not headed to the disabled list. It has long struck me that the missing element in the issue of performance-enhancing drugs — in baseball and other sports — has been a public examination, by the athletes involved, of the ethics. The big why, if you will. The surest sign that the players always regarded PED use as unethical was, and is, the secrecy surrounding it. A pitcher gets a cortisone shot for his sore shoulder, it's known. Same pitcher gets human growth hormone for the same injury, he's not letting anybody know it. Here, from the Chicago Sun-Times, is a first-person account of his own big why from Jim Parque, who went 31-34 over six major league seasons around the turn of the millennium, mostly with the White Sox. And here is a piece on the reaction from the White Sox clubhouse. Ozzie Guillen's comment ... well, that's Ozzie. Facing the worst offense in the American League, the Twins allowed 14 runs on Monday, 16 on Wednesday. And to think I denegrated Anthony Swarzak's work on Tuesday. At least he got outs. Glen Perkins (right) got only three outs on Wednesday, then reported some shoulder problems. He downplayed them to the media, but he's going to see a noted specialist on Thursday (as will third baseman Joe Crede, something to be discussed on another day). The Twins being the Twins, Perkins is unlikely to make his next start (Monday) no matter what the specialist says. Which raises the question: Then who will? My guess is either R.A Dickey or Brian Duensing, both of whom pitched Wednesday, both long enough that they won't be used Thursday. Dickey threw 86 pitches, easily what I call the moral equivalent of a start — meaning he ought not be used again until Monday anyway. On that basis, I think Dickey's the guy to start on Monday. But he may be in Ron Gardenhire's doghouse after his fastball to Ian Kinsler on Sunday, plus his ERA has gone from 2.37 on July 1 to 3.62 now. 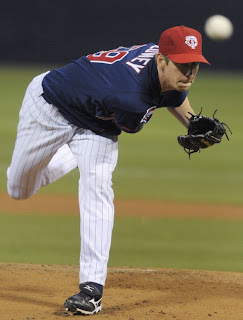 Kevin Slowey, still on the disabled list, has gone to Rochester for a rehab assignment. The idea is for him to make one start, maybe two, to test his wrist. At best, he'll be pitching with discomfort with surgery after the season. At worse, he'll need the surgery sooner. He's to pitch Saturday; even if that start goes well, he won't be an option Monday against the White Sox. Kevin Mulvey, who relieved Perkins in the second inning and had an ugly line of his own, was shipped out after the game and Jesse Crain recalled. His ERA while in the minors was good, but the word was that his fastball command was still lacking. Perkins' line from Wednesday is quite remarkable. One inning, six hits, three walks, eight runs, and a throwing error. He threw first-pitch strikes to nine of his 12 hitters, which is a good rate, but only 22 of his 41 pitches were strikes. He says his shoulder doesn't hinder his pitching. Something sure was. A deceptively good start for Anthony Swarzak. Four hits and two runs in seven innings — not bad. But the three walks (to just four strikeouts) isn't strong, and he wasn't consistently working ahead of hitters. The A's, despite their 14 runs on Monday, are a weak offensive club, and they made Swarzak look better than he pitched. Joe Mauer banged out a pair of hits and scored the winning run. Matt Guerrier was stellar in relief for the win. And after throwing 33 pitches Tuesday, I doubt Oakland's closer, Andrew Bailey, will be available for this afternoon's game. The Twins had more chances than did the A's and barely took enough advantage. Minnesota was just 1 for 9 with runners in scoring position. But the Twins had the only extra-base hits (a double and two triples), all of which figured in the scoring. I critiqued Gardenhire's bullpen choices in some detail after the Monday fiasco. The game notes in the AP story linked to above noted that Brian Duensing and Bobby Keppel were unavailable on Tuesday. I spent much of the game driving back from Wisconsin listening to the radio and wishing I could take notes on John Gordon's slip-ups and nonsense. Example: He was talking at one point about how difficult outfielders find the Oakland stadium. He mentioned the wind and the lack of clouds (high sky). Then he said: The bright sunshine is also a problem, especially during day games. Yeah. When the sun is a problem during night games, Gordo, we have a story. Then there was his confusion between Oakland pitcher Dallas Braden and first baseman Daric Barton. I found myself wishing Oakland had somebody named Burton just to make it a complete mess. At one point Gordon had Barton pitching "14 quality saves this season." He mean Braden and quality starts. Gordon's never really good, but he's far more mistake prone in day games after night games. Like Wednesday. Before I leave, here's an excellent breakdown (from Circling the Bases' Matthew Pouliot) of why umpire Mike Muchlinski blew the call at the plate for the last out of Monday's game. Having brought up the topic again, I should say that that play wasn't the reason the Twins lost. If Cuddyer is called safe, of course, the game's tied, and maybe the Twins don't lose. But that game was lost because Nick Blackburn, Duensing and Keppel couldn't get outs. The Cuddyer play shouldn't have mattered. I know, I know. The Twins had a 10-2 lead and you figured it was in the bag and went to bed. And now you see this headline. Sorry. A truly ugly game. The Twins hit four homers in the first three innings and had that 10-2 lead. Oakland's pitchers threw 214 pitches, just 123 of them strikes. The Twins drew eight walks and had seven extra-base hits. The numbers don't lie. Not only did Nick Blackburn give up 13 hits in his five innings, he didn't strike anybody out. Highly hittable. (For that matter, none of the relievers whiffed anybody either.) Blackburn left after just 92 pitches (66 strikes) and seven runs allowed but leading 13-7. Then came the curious bullpen stuff. The backdrop is important here. Remember, the Twins added a 12th pitcher during the All-Star break, Kevin Mulvey. He didn't pitch in the Texas series, which was understandable, because the games were close and they'd rather have Mulvey make his debut in a low-pressure situation. Sunday's game went 12 innings. Everybody in the pen worked except Joe Nathan (who had pitched the previous two days) and Mulvey. Brain Duensing threw 16 pitches Sunday (and was the losing pitcher). He was also up and down during the first five innings Monday. As a general rule, it's unwise to warm up a relief pitcher multiple times. Duensing warmed up Monday at least twice, maybe three times — and then Gardy brought him in. Which makes me wonder why Mulvey's on the roster. If he's not going to be used with a six-run lead — if the manager would rather use somebody on consecutive days on multiple warm-ups — what's the point? Duensing got four outs — and allowed four hits and two walks. That tied it at 13. In came Jose Mijares — no argument from me on that move — and his first pitch was crushed by Jack Cust. That made it 14-13. Mulvey wound up pitching after all, getting the last out of the eighth inning. The came the bottom of the ninth. With two outs, Michael Cuddyer doubled. Jason Kubel was walked intentionally (Kubel was 3 for 3 with a homer and three walks). With Delmon Young up, Michael Wertz threw a pitch to the backstop. Cuddyer went not just to third but home as well. He beat the tag — clearly beat the tag — only to be called out. The Twins tonight start a week-long West Coast swing. The reality of our current print deadlines is that we're unlikely to have game stories in the paper after the night games. But I'll post commentary and a link to the AP game stories here after each of the night games, just as I did with last night's extra-inning affair. *Guys who can make a living as pinch-hit specialists fascinate me. There have been quite a few of them in the 40 years that I've been following the game — Jose Morales (the first one, who played for the Twins in the Gene Mauch era), Terry Crowley, Lenny Harris, Mark Sweeney, Manny Mota come immediately to mind. Randy Bush milked an extra couple of years out of his career in the role. Brian Buscher (above) looks to me like he has a chance to carve out such a niche. The man's career OBP as a pinch hitter is .500. Granted, it's only 32 plate appearances, but that's the kind of thing that can get a reputation. And reputation counts. * A lot of contenders — including the Twins — had scouts at Roy Halladay's start Sunday. I'm guessing the Twins scout wasn't there to eyeball Doc. He was looking for bullpen arms. It wasn't a good day to see Toronto's relievers in action. The game-winning homer came off R.A. Dickey's fastball, which isn't so blinking fast. Rule of thumb No. 1: Relief pitchers shouldn't get beat on anything other than their best pitch. For Dickey, that's the knuckleball. Now, there are exceptions. If somebody like Tony Pena Jr. is up with the bases loaded and the winning run's on third, the danger is more from a wild pitch or passed ball. But Ian Kinsler is a quality hitter. Rule of thumb No. 2: If the knuckleball's too dangerous for a situation, Dickey ought not be pitching. * The run that scored on a passed ball, which may have been the result of a cross-up in signals between Joe Mauer and Liriano. Mauer, by the way, no longer leads the American League in batting average. He's down to .358 for the season. His average dropped 13 points in Texas (1 for 13 for the series). Ichiro Suzuki is now leading the AL at .363. The Twins did take the series. But it was yet another winnable game that slipped away. The Twins have signed second baseman Mark Grudzielanek to a minor-league contract. He's roughly 93 years old (OK, 39), missed most of the second half last season with an injury and hasn't played a lick this year, but his lowest batting average in the last six years was .294 — and, perhaps most important, he isn't Alexi Casilla. It's a minor league deal, but he didn't sign to play out the season in Rochester or New Britain. His has been an interesting career — far better in his thirties than in his twenties, and if that sets off Bret Boone-type alarm bells, so be it. Good batting averages, not much power, and very few walks. One Gold Glove (2006), one All-Star team (1996). Harry took one look at (his name), thought about spelling it backward, and said on the air, "Steve, it looks like it's already spelled backward, or maybe sideways." After a few trips to the plate and several "Gruzzulniaks," Harry decided he would say, "All of his teammates refer to him as Mark G," and that's what Harry did from that point forward. That fell into the category of Harry's reality. Last season I was eager to see the Twins trade for Grudzielanek. Casilla had hurt his thumb, and the word was that he was likely to need season-ending surgery. If the Twins inquired about Grudzielanek then, they didn't like the Royals' asking price. The July 31 trade deadline passed; on Aug. 2, he went on the DL with a sprained ankle and hasn't played since. I don't know what to expect of him now. A 11-month-plus layoff isn't calculated to help anybody, much less a middle infielder who just turned 39. Plus, from a purely selfish viewpoint, I don't cherish the challenge of working that name into a one-column headline. Or any headline. On the other hand: Casilla is 1-for-9 in his latest round with the Twins and is hitting .175 in the bigs. He has a little more reason to look over his shoulder now — not that he should have been feeling secure anyway. Eight (45%) said Jason Kubel; seven (35%) said Nick Blackburn; two (15%) said Denard Span; one (5%) said Kevin Slowey; zero said Matt Guerrier. I'm a little surprised Guerrier got nothing from ya'll. Anyway ... new poll up. It again ties into the Monday print column, which this week will be about the resistance among some in the game to the newfangled statistical evaluations of defense. "There was a big controversy. 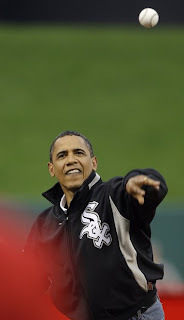 I think Major League Baseball wanted him to wear the All-Star jacket, and he was intent on wearing his White Sox jacket. He prevailed in that." —David Axelrod, President Obama's top political aide, and a Cubs fan to his boss's White Sox fan, on the president's role at the All-Star Game. Comment: You gotta love this about Obama: He has a team he roots for, he embraces that team, and he doesn't hide it. Hillary Clinton, in contrast, has called herself a Cubs fan and a Yankees fan, depending on what audience she's trying to appeal to. * This from the Chicago Tribune's Phil Rogers: Don't overlook the Twins as a possible playoff team. They are 13-9 against the six teams in first place at the break. Only the Rays (10-6) had a better record, with no one else more than two games better than .500. * The Tigers lost their best, or at least most talented, relief pitcher, Joel Zumaya. Zoom-zoom and his 100-mph-plus fastball is on the DL with yet another shoulder problem. At this point, one has to doubt he's ever going to be the same again. He told the Detroit News: "I'm disgusted, upset, don't know what to think. Obviously, my arm's not feeling too good right now. My head's going in circles. There's only so many bullets your arm has." *Everybody's writing about Joe Mauer. It's sure nice to have the Twins back after the break, isn't it? And even better to have them return with a win. 1) Jason Kubel (above) had a home run and a single, and he's now bopping along with a .926 OPS. That's ninth best in the American League, but only third best among left-handed hitters on his own team (Joe Mauer's at 1.060, Justin Morneau's at .972). 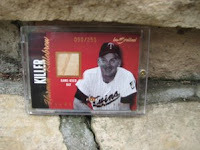 Kubel probably would have been at their level earlier had he not blown out his knee back in the fall of 2004. It's taken a long time for his legs to get sound again. But in one important way, he's not at the Mauer-Morenau level. He's still weak against his fellow southpaws. His slash stats: .356/.409/.663 vs. right-handed pitchers, .194/.256/.250 vs lefties. 2) Bobby Keppel had another strong outing: Six batters faced, six batters retired, three strikeouts. He now has an ERA of 0.63, and while that's obviously unsustainable, he's doing it with lots of ground balls (a GB/FB ratio of 1.86). We have seen the Twins lean heavily in the past on right-handed pitchers (starters and relievers) who were said to rely on their sinker: Joe Mays and Carlos Silva, Luis Ayala and Brian Bass, to name four. None of them ever got this many ground balls. It's a thin sample size. He hasn't fully converted me. But he's sure getting the job done. The Twins will open the "second half" of the season with 12 pitchers again. Kevin Mulvey comes up, No. 3 catcher Jose Morales goes down. I've alluded to this before, but I'll repeat myself anyway: Morales does more to help the Twins win games than a No. 7 relief pitcher does. It would be one thing if they were adding a solid 8th-inning power arm, somebody to ease the burden on Matt Guerrier and Jose Mijares in the late set-up role. But Mulvey is to pitch long relief. Which is the preferred roles of Brian Duensing and R.A. Dickey and maybe Bobby Keppel, although it sounds as if the Twins have a share of the late innings in mind for Keppel. He's fared well so far, but I remain skeptical. Mulvey's numbers in Triple A this season are a bit worse than last season's, and certainly not anything demanding a call-up. Here's the deal, folks: The more often Duensing and Mulvey are used, the worse the Twins are doing. They are not guys they want to use in winnable games. The more of that kind of pitcher they have around, the more likely they are to have to use them in winnable games. Asked what the Twins must think of his success, he said, "It's kind of a pleasure for me. They needed Delmon [Young], and they wanted to get rid of me, and that was kind of something to push me." The key phrase there: They wanted to get rid of me. Now, the Twins front office has never described the inclusion of Bartlett in what is commonly known as the Matt Garza-Delmon Young trade in anything like those words. We can dismiss this as a version of that tired claim by a championship team, "Nobody believed in us but ourselves." Athletes will create underdog status for themselves as a motivator -- and Bartlett does say it was kind of something to push me. That said, the Twins did give him up in that trade, and shortstop has been a problem for them since. And I do think the Twins undervalued Bartlett. I think the Twins know about the sophisticated defensive metrics but prefer to judge fielders by the evidence of their eyes — traditional scouting. Bartlett shined with the Twins in the metrics, but in 2007 — the year before the Twins sent him to Tampa Bay — about a third of his errors came in the first two innings and resulted in unearned runs that put the Twins behind. I wrote about this at the time, how this doubtless stuck in Ron Gardenhire's craw. And Gardy was slow to accept Bartlett as his shortstop to begin with. His rationale was that Bartlett didn't carry himself with the aggressive, take-charge attitude that Gardenhire regards as essential for the position. It wasn't until Terry Ryan, then the general manager, gave his manager no other choice that Bartlett got the job. The Rays know traditional scouting; that's how they drafted and signed Young to begin with. They also, I believe, have a better grasp of the sabermetric virtues, and a willingness to accept newer ways of judging talent — which was why they were willing to deal Young away, why they decided Brendan Harris was unacceptable at short, and why they wanted Bartlett. * Typical Joe Mauer: A line-drive double (to left field) to drive in the game-tying run. Scored another run. And he saw 14 pitches in his three plate appearances. Ichiro saw the same number; nobody on either team saw more. 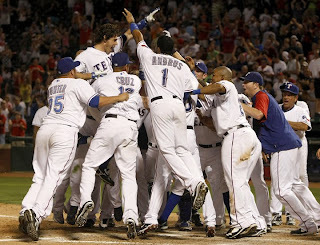 * Somebody at the AP identified the pitcher Mauer's talking to at right as Josh Hamilton of the Texas Rangers. Uh, no — Hamilton's an outfielder. That's Roy Halladay of the Toronto Blue Jays. On the other hand, maybe it was Hamilton, and that's how the National League scored three runs in the second inning. * Joe Nathan turned what started out as yet another routine inning for the AL pitchers into a nail-biter with a walk and a single. But he struck out Ryan Howard to end the threat. *Justin Morneau was 0-for-2 but had a near extra-base hit denied in the ninth inning. *And that greatest of the Mankato Mashers, Curtis Granderson, came through big-time for the AL with his eighth-inning triple. The Washington Nationals — possessors of a .299 winning percentage this season — fired manager Manny Acta on Monday. What an ill-run franchise: An interim general manager, an interim manager, a scandal in its Latin American scouting operation, a roster badly in need of detonation — even uniforms with the team name misspelled. From the outside, it's difficult to tell what role Acta played in the deterioration of the team's record. In his first season, the Nats were 73-89; in his second, 59-102; and now 26-61. Peter Gammons on Monday's Baseball Tonight called it "the most ill-conceived roster," and that's an accurate assessment. What input Acta had as former GM Jim Bowden went about accumulating corner outfielders and first basemen is the question the comes first to my mind. If Acta assured him that Lastings Milledge and Elijah Dukes were capable center fielders, then Acta shares the blame for the silliness. The second question is why the Nationals' bullpen is such a mess. A useful quick-n-dirty gauge to the quality of an organization is the bullpen. A sharp operation can dig up usable arms for short stints. Operations that have repeated bad years in the pen (the Mets, the Indians) get those bad years for a reason. The Nationals' pen has deteriorated each season under Acta. There are things I like about the Nationals. In Jordan Zimmermann, John Lannan and Ross Detwiler, they have three starters of promise. Assuming they (a) get first-round pick Stephen Strasburg signed and (b) keep everybody healthy, they could very quickly have the best starting rotation in the division. That's something to build on. They need some players who can catch the ball — starting with center field and second base — to protect those pitchers. And that's going to require a GM who can turn their ridiculous surplus of DH-first base-slow outfielders (Adam Dunn, Dmitri Young, Josh Willingham, Austin Kearns, Nick Johnson) into something usable. As for Acta: I suspect there are a half-dozen teams that would benefit from having him as their manager rather than the current occupant. But that's only a suspicion. I'm inclined to put the blame for the ill-conceived roster on Bowden. But Acta was in the room. 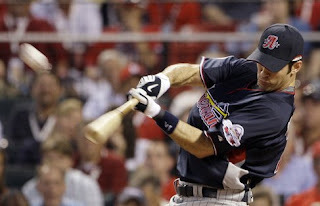 I'm satisfied with Joltin' Joe Mauer's performance Monday in the Home Run Derby. He didn't get goose-egged, a la a certain Detroit Tiger, and by getting eliminated without going to the second round, he probably didn't overexert himself on a theoretical night off. I'm not inclined to get too wound up about the supposed dangers of the Derby — that players wear themselves out for the season and/or screw up their swings trying to hit three dozen long balls. Justin Morneau's September slump last year may be been because he was weary, but that can hardly be blamed on one night in July. That was months in the making. Still, Mauer is a catcher, and fatigue is always a factor at that position. Plus his batting has fallen off in the last week or so. So a short night is a plus for him. I'm writing this while the Derby is still going on — truth is, I stopped watching after Mauer was eliminated in the swing-off. A little of that ESPN crew goes a long, long way with me these days, and I'd seen all I needed. ... third try this year, at least. More like five for his career. This is a crucial move for the Twins,and for Casilla. They've divvied up the middle infield four ways this season — Nick Punto, Brendan Harris, Casilla and Matt Tolbert. None of them are complete players — and none of them have taken a job and made it his. Casilla, athletically, is the least limited of the four. But he has a penchant for screwups, which is why he has twice been demoted. But if there is anybody on hand capable of cementing a middle infield position, it's him. But at some point, one has to figure he's not capable of holding his focus long enough to do so. The Star Tribune story on the move takes note of Casilla's .340 batting average in Rochester and the .191 batting average of the Twins No.2 hitters other than Joe Mauer. Same guys, just more at-bats over the course of time for Mauer & Morneau, since they'd be one spot higher each, and a lot fewer AB for the middle infielder. Casilla's stats for the season, majors and minors, here. Eleven people participated in the "who was left out" Top 10 Twins poll. This one allowed multiple entries, so we had 14 votes. Nick Punto (right) is hitting .130 in July — 3 for 23. Which is (obviously) lousy. With nine walks, so his on-base percentage is .375. Which is pretty darn good. There's a sample size issue there, of course, but nine walks in 32 plate appearances means he's not being a total disaster offensively this month. Not that's he's been good. Just better than Brendan Harris. The seven, according to STATS LLC via ESPN.com: Giambi, .192; Chris Davis (Texas, currently in the minors), .202; Ken Griffey Jr. (Seattle), .220; Mike Jacobs (Kansas City), .222; David Ortiz (Boston), .222; Cust, .230; and Carlos Pena (Tampa Bay). .230. Now, most of these guys look a bit better in OPS, which gives credit for power and walks as well as batting average. But even there, only Pena (14th) ranks in the top half. These guys are DHs and first basemen because they can't run and can't field. And if they can't hit, either, what use are they? *Looking at the OPS rankings: Davis is ahead of only an aging shortstop (Orlando Cabrera of Oakland) and a crippled third baseman (Adrian Beltre). Noteworthy because there was talk during the winter of the Twins acquiring either or both of those guys. Twins general manager Bill Smith takes a lot of heat for some of his moves; the Matt Garza-Jason Bartlett for Delmon Young-Brendan Harris deal looks worse every month. He's avoided some bad ones too. "I never cheated the Twins, the fans or my opponents." 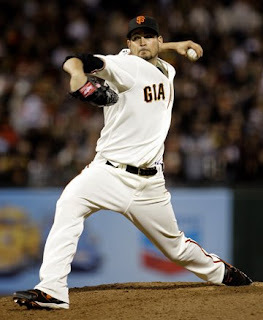 Item: Jonathan Sanchez of the Giants no-hit the San Diego Padres on Friday. Comment: Sanchez (right) is one of the good young power arms the Giants have accumulated over the past few years, but unlike Tim Lincecum or Matt Cain, he's never quite figured it out. This game left him with 331 strikeouts in 328 2/3 career innings — and a career ERA of 5.07. And let's face it: It was the Padres. Team batting average: .232. Sooner or later, somebody was going to no-hit them. Item: Joe Mauer is going to compete in the Home Run Derby on Monday. Comment: The National League has four first basemen with big power reps entered: Prince Fielder, Adrian Gonzalez, Ryan Howard and Albert Pujols — career total 805 home runs and three home run titles. The AL at this point has Mauer and Brandon Inge committed — 174 HRs total. We get this every so often — a great hitter without a home run rep entered in the Derby. (Mauer's the great hitter I'm talking about; Inge is something less.) Ichiro and Edgar Martinez come to mind. Generally they come in with their manager talking about the power show they put on in batting practice and leave having lived up to their real-life reputation. Item: One of the Chicago beat writers was struck hours before game time Friday by the sight of eight Twins taking early bunting practice. Then the Twins used late-inning bunts to score the tie-breaking run in the seventh (Denard Span moving Nick Punto into scoring position in front of Mauer's single) and an insurance run in the eighth (Carlos Gomez with a two-out bunt single to drive in Matt Tolbert). Comment: Kind of speaks for itself, doesn't it? I thought, and wrote, that the Twins were making a mistake during the offseason by keeping Matt Guerrier (right) in their bullpen plans. I compared it to their decision the year before to keep Juan Rincon and said I would rather they found a new mistake to make. Guerrier has been the most reliable non-Nathan reliever in the Twins bullpen. The stats are good enough to merit All-Star consideration — there's a very good argument to be made that he Guerrier has been the best set-up man in the league. He collected his 17th hold Friday night. He leads the AL in appearances. He has allowed less than a baserunner per inning. He's 4-0 and has blown just one lead. This after a horrid 2008 in which he was overworked in the middle part of the season. The middle relief crops remains a muddle for the Twins, although that may be more a matter of perception than of reality. Jose Mijares can exasperate the manager, coaches and fans with bouts of control issues, but he has enough stuff to get away with it. R.A. Dickey and his knuckleball was brought in to eat innings, and he's been more than that — still nobody's idea of the guy to bring in with key men on base, but a 2.83 ERA is strong enough to argue for an expanded role. Guerrier himself is not a classic power arm. Then there's Bobby Keppel, whose history suggests he's a Quadruple A pitcher — effective enough for Triple A, not good enough to succeed in the majors. Keppel's ERA is a flat zero through 11 1/3 innings, although he's quick to deflect any suggestion that he's that good. Nobody is, obviously. That's four of the five non-Nathan arms currently in the Minnesota 'pen. The other is Brian Duensing, who is the current occupant of the second-lefty role held earlier by Craig Breslow and Sean Henn and not a fellow Ron Gardenhire is itching to call on in the late innings. There are reasons to fret about all the others too. But so far, they're getting outs. These three games were more discouraging than the four games in the Bronx Bandbox in May. In many ways, the Twins played well in that road series. In this series — even though two of the games were superficially close — the Twins were really never in any of the games. The starting pitchers nibbled. Well, maybe not Francisco Liriano; he just plain didn't throw strikes often enough, which has always been an issue. Brendan Harris, as detailed in a previous posting, sabotaged Anthony Swarzak's start on Wednesday; on Thursday, Harris sat and it was Matt Tolbert with a pivotal misplay. I'm not going to dwell on this fiasco any further. About a month ago, when Nick Punto was on the shelf and the Twins were on the road in Oakland, there was a late night game in which Brendan Harris played a one-hopper off his chest. The official scorer called it a single, which might have been a sensible ruling had Harris been playing bare handed. A few innings later, Harris made a lunging backhanded stop of a grounder and threw to the third baseman for a force out. In the game story the next day, Ron Gardenhire said of Harris, "He played the hell out of the position." I am 99.9 percent sure that Gardy was thinking of the backhanded play and forgetting the ball that bounced off his chest. Harris has been a fixture at shortstop since. The line is that he's more comfortable at short than at second (OK) and Punto can handle either position. And, even considering that Harris is now 2-for-27 this month — a sweet .074 batting average over seven games — there's no question that he's a better hitter than Matt Tolbert, the other middle infield option currently on the 25-man roster. But he's no shortstop, at least not a major league-caliber shortstop. Defensive stats are odd things. They often seem designed to hide the truth. Part of it is that there are going to be 27 outs made, no matter how many hits go through a rangeless or ill-positioned defender. Part of it is the subjective nature of scoring calls. For example, in the second inning Wednesday night, Harris made a play behind second base, did one of those pivots to get into the proper throwing angle — and overshot Justin Morneau, pulling him off the bag. Single. Yeah, right. It was a play a major league shortstop in 2009 is expected to make. The Yankees scored three runs that inning. If Harris makes that play, gets that out, they score zero. And, of course, the Twins lost 4-3. I counted three plays that night Harris (in my judgment) should have made and did not. One of them was ruled an error. Just one. The next time you hear John Gordon extolling the wonders of the Twins defense on the basis that they con't commit errors, remember that "hit." There has been no shortage of complaints, here and elsewhere, about the Twins failure/inability to upgrade their middle relief corps. In that light, the trade Tuesday in which the Chicago White Sox acquired Tony Pena (right) from the Arizona Diamondbacks is instructive. Pena is a generic middle man. Nothing particularly outstanding —a good fastball, but not a particularly noteworthy strikeout rate. The Snakes used him a lot to protect leads — 30 holds in 2007, 23 in 2008 — but the ERAs aren't all that good. To get him, the Sox surrendered Brandon Allen, an impressive power prospect who has split this season between AA and AAA. The Twins don't have a minor leaguer directly comparable to Allen — a first baseman, nearly major league ready, with significant power. The closest would probably be Chris Parmelee, and he's only in High A ball. Would the Twins give up Parmelee in a trade for a mediocre set-up guy? I have my doubts. Seeing the D'backs move Pena reminds me of another Arizona relief pitcher who came to the AL Central for this season: Juan Cruz. There were people unhappy this spring when the Twins decline to meet Arizona's price for Cruz, who wound up with Kansas City — where he has walked 18 in 36 innings and racked up a worse ERA than Luis Ayala. Moral: The Twins haven't pulled the trigger on a bullpen arm. That hasn't necessarily been a mistake. 10-2 is 10-2. You get beat by that score, there's no one thing to point to as the reason. You just got your clock cleaned. Those who've read me over the years know that I am a big advocate of bunting on power pitchers. Most of them — almost all of them — hate fielding bunts. Their follow-throughs generally leave them off balance. They often throw poorly to the bases. Bob Gibson was a superb fielding pitcher; you'd have a hard time coming up with another power pitcher who was a Gold Glover. 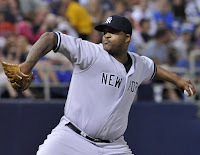 CC Sabathia is not only a power pitcher, he's fat. He hates getting off the mound to field a bunt. Add to that the current word on the post-operative Alex Rodriguez at third base — that word is "immobile" — and you have an obvious recipe for the Twins on Tuesday night. Bunt. Make him move, make A-Rod move. And to hear Bremer and Blyleven chatter on the tube coming into the game, the Twins had that in mind. The Twins want to bunt and run on Sabathia. So what happened? Nothing. Absolutely nothing. If anybody even showed bunt, I missed it. Of course, by the time Carlos Gomez came up, the Twins were down three runs and the bunt probably wasn't in order. But Denard Span certainly could have tried to bunt for a hit in the first inning. While I'm not sure I've ever seen Brendan Harris try to bunt for a hit, it sure couldn't work any worse than what he's been doing lately at the plate. He is now 2-for-23 this month. Yes, 10-2 is 10-2. They could have at least made Sabathia work a bit. This photo of Brandon Inge was from the 16-inning game Friday night, and it didn't make it into the paper, but I love it anyway. * I'm not one to invest emotional capital in who does and doesn't make the All-Star team, but it seems a bit odd to me that this guy is out and this guy is on the Internet ballot to be the AL's 33rd man. Speaking of which: 32 guys on the National League roster and not a healthy center fielder in the bunch. * Joe Mauer's a rapper? Really? 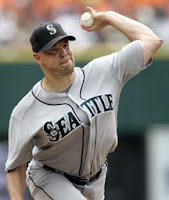 *When Kevin Slowey connected his wrist pain to the line drive that hit him in his final start of 2008, I figured there was some sort of bone problem — a tiny unhealed crack that got worse with pitching, a bone chip, something of that ilk. Apparently not. If this word holds true, he should be back pretty quickly. "There have been some good players to come out of Europe, but I think the thing that Max has going for him is that he's 16, but he plays like he's older," said Georgia State coach Greg Frady, who has also coached the German national team the last six years. "His mechanics look like he's older. He's so fluid in the things that he does and he looks a lot more polished than the average 16-year-old in Europe." The key word here is "Europe." He may be a athlete, but I'm not saving a spot for him on the big-league roster in five years. As promised in the Monday column, here's a place to argue with me on my list on the 10 greatest Twins. I could easily have picked Jim Kaat over Hunter. The poll on the best change up was pretty overwhelming: 13 picked Santana, one Frank Viola, and nobody went for Brad Radke or Eddie Guardado. No real surprise there. The new poll, as you might have guessed, ties into the Monday column yet again. Buster Olney writes on ESPN.com of potential trade partners with the Atlanta Braves, the core concept here being that the Braves are willing to deal shortstop Yunel Escobar for an outfield bat. Escobar would be perfect for the Twins in many respects, and Minnesota has an array of outfielders to choose from, whether it be Michael Cuddyer or Denard Span; Delmon Young is hitting .264 with three homers, and it's hard to imagine that the Braves would seriously consider him in any trade. But the Twins' focus is on relief pitching, and an aggressive midseason deal really doesn't fit their style — and if Escobar's conduct in Atlanta has turned off the Braves' coaching staff, then this is certainly not the type of thing that the Twins would go for. Span is an interesting name, though, because his service time (and salary) is close to that of Escobar, and he is widely seen as a player on the rise. The possibility that the Twins would deal Span for a shortstop exhibiting attitude problems is slim to none. Not only because they value Span, and not only because they don't put up with such behavior, but because they'd likely rather acquire a second baseman than a shortstop. Brendan Harris' (photo above) stats have plummeted in the past few days — he's 1-for 15 in July — but Ron Gardenhire finds him acceptable at short and unacceptable at second. Get a second baseman, and the Twins would probably find some way of time-sharing short between Harris and Nick Punto. Get a shortstop, and Harris becomes almost useless. *It was an odd sentence about Francisco Liriano in the AP's game story: "He intentionally threw a lot of first-pitch strikes, which ultimately hurt him in the seventh." He should intentionally throw a lot of first-pitch strikes. The best pitch in baseball is the first-pitch strike. It's called getting ahead of the hitters. Liriano faced 27 men and threw 18 first-pitch strikes. He threw, in total, 103 pitches, 65 strikes, 38 balls — not quite the preferred 2-1 ratio, but closer than he often is. A good game for Liriano. * Magglio Ordonez has just 14 extra base hits this year. Three of them have come against the Twins. * Jose Morales failed twice to get down the bunt in the bottom of the eighth inning (bad). Then he hit a slow roller that moved Matt Tolbert to second (good) and was applauding himself as he crossed first base. Moral equivalent of a sac bunt. Nothing against Mike Redmond, but I'm increasingly ready for the Jose Morales era at backup catcher. * The game stories (AP and elsewhere) make mention of it, but let me join in: That was some good baserunning by Tolbert to score the winning run. A colleague speculated during Friday night's game that Kevin Slowey (left) must be hurt. And sure enough, the Twins put him on the disabled list after the 16-inning marathon. It was Slowey's second straight lousy start, but he says the wrist only started hurting Friday. His belief is that it's related to the line drive that hit him in his final start of 2008. So Anthony Swarzak gets the callup. Since the Twins have another off day coming up between the Tigers and Yankees, he'll serve as bullpen reinforcement first, then slide into Slowey's rotation slot. One thing this does, at least for a bit, is dampen speculation that the Twins could trade Swarzak or another starter for a relief pitcher or middle infielder. * I like this year's red "flag cap" more than last year's blue. But lordy, the red one and the blue uniform top don't work together. And I'm not all that likely to spend $35 for any cap these days. * Jose Mijares, whose struggles versus righties appeared to have pushed him into a LOOGY role, had a strong two-inning stint Friday. No hits, no walks, three strikeouts, five first-pitch strikes to seven hitters, 24 strikes total to just eight balls. The only baserunner struck out. He even got five right-handers out. * Happy Fourth of July, dear readers.